The following lists generalized descriptions of typical pruning projects. Depending on your individual needs, we will provide site-specific specifications. Crown Thinning - Crown Thinning consists of the selective removal of branches to increase light penetration and air movement while reducing weight. The canopy will be thinned in a manner that leaves the tree looking natural and typical of the species. Crown Cleaning should be performed as part of the Crown Thinning process. Crown Cleaning - Crown Cleaning consists of the selective removal of one or more of the following items: dead, dying, or diseased branches, co-dominant trunks, weak branches and crotches, and watersprouts. Crown Cleaning may be performed in conjunction with Crown Thinning. Crown Raising - Crown Raising involves removing lower branches to provide clearance. Crown Reduction - Crown Reduction decreases the height and/or spread of a tree. Consideration is given to the ability of the particular species to sustain this type of pruning. Crown Shaping - Crown Shaping reduces the length of branches that are growing aggressively beyond the canopy of the tree. The finished appearance will be uniform and well-groomed. Crown Shaping may be performed in conjunction with Crown Thinning. Crown Restoration - Crown Restoration improves the structure, form and appearance of trees that have been severely pruned, vandalized, or storm-damaged. Pollarding - Pollarding is the annual or seasonal pruning of a tree back to originally designed heading cuts. Multiple sprouts will originate at these heading cuts and will be removed during each pruning. Vista Pruning - Vista Pruning is the selective thinning of framework limbs or specific areas of the crown to allow a view of an object from a predetermined point. 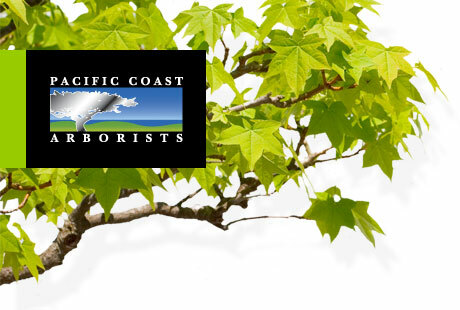 Training Pruning - Training Pruning is performed on juvenile trees and focuses on establishing a framework of branches that is structurally sound and characteristic of the species. Training may require the selective removal of specific main limbs in order to direct future growth into more structurally viable branches. Canary Island Palms - Only brown and yellowing fronds, flowers and dates will be removed. Weed plants will be removed from the “pineapple” directly below the canopy. The canopy will retain a cascading appearance (unnecessarily raising the canopy beyond this point may be detrimental to the health of the palm). Chainsaws will not be used. Handsaws will be sterilized in 50/50 bleach and water solution. Date Palms, Mexican Fan Palms - Brown and yellowing fronds, flowers and dates will be removed, and the canopy will be raised so that it is approximately perpendicular with the trunk (unnecessarily raising the canopy beyond this point may be detrimental to the structural integrity of the trunk). King, Queen, Royal, Kentia, Fishtail Palms - Only brown and yellowing fronds, flowers and dates will be removed. The canopy will retain a natural appearance. Pineapple Cleaning - If pineapple cleaning is requested on Canary Island Palms, the old, loose frond bases will be stripped up to where they are firmly attached to the trunk.